In order to evaluate two-dimensional radiation dose distributions, an algorithm called the Gamma function has recently been modified. The current study concentrates on modification of the gamma function as a three-dimensional dose distribution evaluation tool, and includes the recognition of over-dose/under-dose areas. Using a sign term, the conventional gamma function separates the disagreed areas into two parts: over-dose and under-dose areas. The new gamma function was modified using an extension of the dose difference criterion, ΔD, from two dimensions into three dimensions. 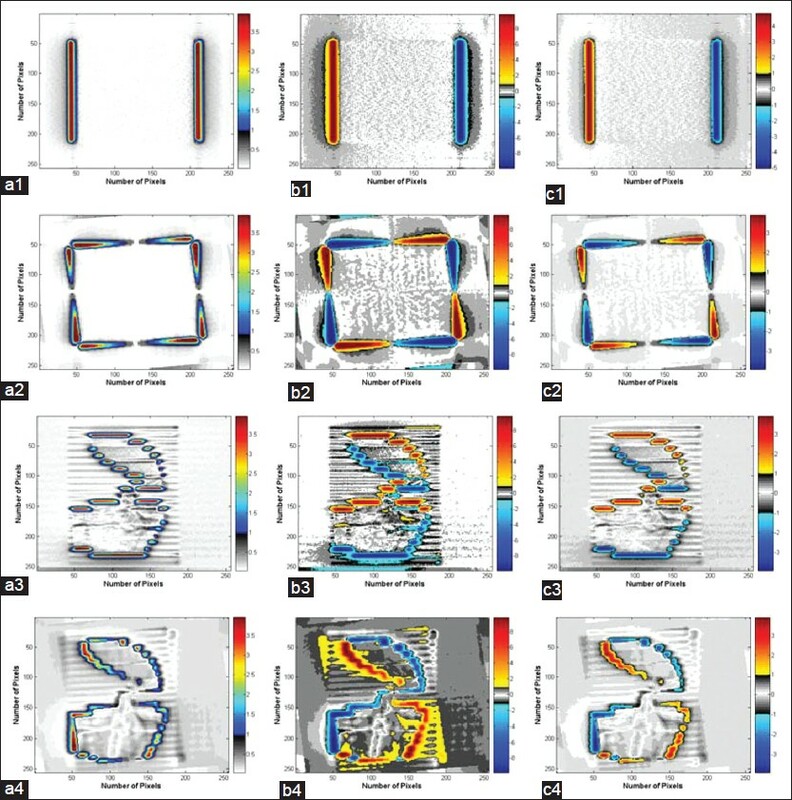 In order to provide two-dimensional dose maps for analysis, several images were acquired for a range of regular and irregular radiation fields using a Scanning Liquid Ionization Chamber Electronic Portal Imaging Device. The raw images were then converted into two-dimensional transmitted dose maps using an empirical method. They were utilized as reference dose maps. Translational and rotational manipulations were performed on the reference dose distribution maps to provide evaluated dose maps. The reference and evaluated dose maps were then compared using conventional and modified gamma tools. The results indicated that the modified algorithm is able to enhance the over- and under-dose regions. In addition, a slight increase of the agreement percentage for reference and evaluated dose maps were observed by the extension of ΔD to three dimensions. It is concluded that the modified method is more realistic and applicable for the evaluation of both two-dimensional and three-dimensional dose distributions. The concept of the gamma function algorithm has been discussed in detail by Low et al. It has been mentioned that "the evaluated distribution will have at least as high a dimensionality as the reference distribution. For example, the reference distribution may be a two-dimensional film dose distribution measurement, while the evaluated distribution may be a full three-dimensional dose distribution calculation." But there is no report of the development of the gamma function for a three-dimensional practical comparison. In addition, as current treatment planning systems are able to provide a three-dimensional dose distribution, their output can be used as a reference dose distribution while the evaluated dose distribution remains a two-dimensional dose map. The gamma function was used to evaluate two-dimensional dose distributions in numerous reports to quantify the agreement between a reference and an evaluated dose distribution map. ,,,,,,,, However, there are several issues, which need to be taken into consideration. Firstly, the dose distribution is a three-dimensional concept. Therefore, the relevant uncertainties should be addressed in a three-dimensional volume. In addition, although the gamma function is a powerful tool to recognize the agreed and disagreed areas, it is not able to separate the over and underdose regions. Moreover, if there is a search for a consistent dose value in neighboring points in a two-dimensional area, this cannot be extended into a volume. The hypothesis of this study is that "with extension into the third dimension, consideration of the "less or more" fluctuations in the z direction, caused by patient positioning, organ motion, couch positioning, and isocenter calibration, for the point dose displacement in the z dimension can be achieved". The current work concentrates on the evaluation of a typical measured dose distribution as an evaluated dose map and its deviation from a simulated reference dose distribution and vice versa. The gamma function, as one of the popular dose distribution evaluation tools, is used in the current study and modified to enhance the over- and under-dose areas for regions of disagreement. In addition, the gamma function is modified for a three-dimensional assessment. Several digital images were acquired using a Scanning Liquid Ionization Chamber Electronic Portal Imaging Device (SLIC-EPID) for 10 × 10 cm2, 20 × 20 cm2 open, 16 × 21 cm 2 wedged and multileaf collimated fields. In order to create high dose gradient regions on image central area, several images were also acquired in the presence of a 10 cm attenuator layer, covering half of the radiation field. The raw EPID images were then converted into two dimensional dose maps using an appropriate method reported elsewhere. ,, The acquired fluence maps were translated 1 to 5 pixels and rotated 1 to 5° then compared with the original fluence maps. All of the work procedures were performed using in-house codes written in MATLAB 7 (MathWorks Inc, Natick, MA). Where RDMi,j and EDMi,j are corresponding pixel values in reference and evaluated dose maps, respectively. The sign matrix is able to create a binary map of 1 and -1. The modified gamma function is shown in Equation 1. Where and are points of interest in evaluated and reference dose maps respectively. Δd and ΔD are DTA and dose difference criteria at the position. where (z eva - z ref ) 2 was added into the conventional formula. In order to create a three-dimensional map for analysis, two two-dimensional fluence maps located above and below the reference two-dimensional fluence map were extracted from a dose grid calculated using the Pinnacle  treatment-planning system. The three-dimensional map was then compared with that obtained from an EPID image (the reference dose map) using the modified three-dimensional gamma algorithm. Since different approaches were used to obtain reference and evaluated dose maps, the pixel/voxel size of primary images may alter the accuracy of the current study. In order to prevent any interpolation in image resizing and due to the SLIC-EPID pixel size of 1.27 mm × 1.27 mm, the dose difference and DTA criteria was selected as 3% and 2.54 mm, respectively. The outcome of gamma evaluation was investigated for a range of rotated and translated open, wedged and irregular fields. Irregular fields were created using MLCs and also open fields with a 10-cm attenuator layer covering half of the field. 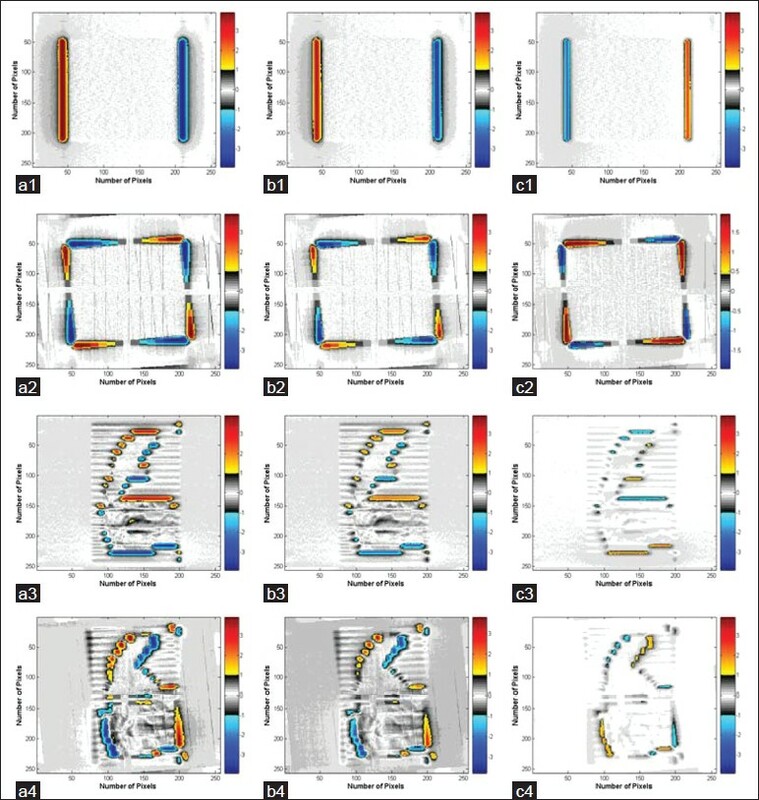 Typical results of conventional gamma, relative dose difference maps and the gamma modified with the sign term are shown in [Figure 1] for regular fields and for an irregular field with 5 pixel translation and 5 degree rotation around the image centre. The values for conventional and modified gamma distributions in agreed areas are shown in grey and in contrast, the disagreed regions for conventional gamma are shown in color. For modified gamma maps, over- and under-dose regions are shown in red and blue respectively. Quantitatively, percentages of agreement and disagreement for the conventional and modified gamma in the above mentioned cases are shown in [Table 1] for a 5 pixel translation and 5° image rotation. As [Table 1] shows no significant difference was observed in the percentage of agreed areas using the modified gamma algorithm for a 5 pixel translation. The modified gamma method is able to enhance the over-dose/under-dose areas. The sign term added to the conventional gamma function is able to produce positive and negative values corresponding to the over- and under-dose areas. This could be a helpful tool to find an appropriate approach including possible translational and rotational misalignments to find the position of the evaluated dose map compared to the reference one. In addition, the dose distribution evaluation, indicating the under- and over-dose region can be a helpful tool in optimizing image alignment using gamma function results. The results of the gamma function modified for three-dimensional DTA and three dimensional dose difference is shown in [Figure 2] for a 5 pixels translational and for a 5° rotational manipulation. The comparison of two and three dimensional sign-gamma functions is also shown in [Figure 2] as differences between two- and three-dimensional gamma assessment (C series). Results show that in all cases studied in the current work, applying the three dimensional gamma function slightly increases the percentage of agreement compared to the two dimensional gamma function. Tabulated results in [Table 2] indicate that the extension of gamma function to three dimensions, which basically produces a three dimensional DTA, increases the percentage of agreement. Although the differences in the percentage of agreement for open fields is low, but comparisons of high dose gradient regions in the dose distribution maps, the difference increases significantly. This can be observed for wedged field and an open field where an attenuator is positioned in half of the radiation field. For a two-dimensional dose distribution evaluation, in order to control unavoidable misalignments between reference and evaluated dose distributions, a two-dimensional DTA criterion is defined. However, several misalignments, and consequently misreading of dose values, due to more or less attenuations and different contribution of scattered radiation reaching to the point of interest can possibly occur in the off-plane area. This kind of mismatching can come from vertical displacement of treatment couch, geometrical patient positioning during set-up procedure, undesired organ motion, which cause more or less attenuation of the beam on-axis and perpendicular to the two-dimensional dose map. As a result, variations of dose values in an evaluated dose distribution map can occur. The important thing is that the inconsistency can be detected by a both two- and three-dimensional gamma functions. However, if the dose variation is within the tolerance with other points in a three dimensional comparison, the three-dimensional gamma function classifies the point as agreed dose area while the two-dimensional classifies it as a disagreed area. As results in [Table 1] and [Table 2] shows the wedged condition, which can be categorized as a medium gradient region, has significant differences between conventional and modified methods. This has led us to conclude that the two-dimensional gamma in the medium gradient region is not able to show the real agreement between two reference and evaluated dose distributions. It should be noted that the two-dimensional gamma function mostly concentrates on low gradient and high gradient regions. In this case, a three-dimensional gamma may improve the results of comparison at medium gradient regions. Regarding the abovementioned issues, the real dose values can be found in upper or lower dose maps in the third dimension. In order to evaluate the results with clinical situations, the modified sign and three-dimensional dose distribution evaluation gamma functions were applied for two lung and breast cases. The results of three-dimensional and signed three-dimensional gamma functions are shown in [Figure 3]. The numerical values of the investigation are also provided in [Table 3]. The results show that like the non-clinical cases shown previously, the three-dimensional gamma function improves the agreement between reference and evaluated dose maps. In addition, a signed gamma map for both approaches (two- and three-dimensional) is able to provide more information about the location of under- and over-dose regions. In the clinical cases, the pixel size in the predicted dose image matrix is not identical with the corresponding transmitted dose maps measured using the SLIC-EPID and an image resizing tool is used to make them the same size compared to measured dose maps. This perhaps decreases the slope of dose gradient in high gradient regions. Although the reference dose map is a two-dimensional dose distribution, each point of a two-dimensional dose maps can be compared with other peripheral points. This leads to a three-dimensional dose comparison. The significance of the difference is that the two-dimensional case underestimates the agreement between two two-dimensional dose maps. In contrast, a three-dimensional gamma map is more practical and results are closer to the real situation. Although the conventional gamma function is able to recognize the agreed and disagreed regions, it is not able to illustrate the contribution of over-and under-dose regions. In the current work, it has been shown that by combining the dose difference map with a sign term it is possible to highlight the over- and under-dose regions in the disagreed areas. The enhancement can also be extended for agreed areas if required. The desired dose map for a three-dimensional dose distribution evaluated in the current study is an array of 3 two-dimensional dose maps and it can be extended into 5 or 7 dose maps pending DTA criterion and the size of dose grid voxels. This extension could be a helpful effort to approach more realistic dose distribution comparisons for two-and three-dimensional dosimetry. The authors express their gratitude to the referees for fruitful comments and advice. The work was supported by the research deputy of Hamadan University of Medical Sciences. 1. Harms WB, Low DA, Wong JW, Purdy JA. A software tool for the quantitative evaluation of 3D dose calculation algorithms. Med Phys1998;25:1830-6. 2. Low DA, Harms WB, Mutic S, Prudy JA. A technique for the quantitative evaluation of dose distribution. Med Phys 1998;25:656- 61. 3. Low D, Dempsey J. Evaluation of the gamma dose distribution comparison method. Med Phys 2003;30:2455-64. 4. Van Esch A, Depuydt T, Huyskens DP. The use of an aSi-based EPID for routine absolute dosimetric pre-treatment verification of dynamic IMRT fields. Radiother Oncol 2004;71:223-34. 5. Agazaryan N, Solberg T, DeMarco J. Patient specific quality assurance for the delivery of intensity modulated radiotherapy. J Appl Clin Med Phys 2003;4:40-50. 6. McDermott LN, Wendling M, van Asselen B, Stroom J, Sonke JJ, van Herk M, et al. Clinical experience with EPID dosimetry for prostate IMRT pre-treatment dose verification. Med Phys 2006;33:3921-30. 7. Bakai A, Alber M, Nusslin F. A revision of the gamma-evaluation concept for the comparison of dose distributions. Phys Med Biol 2003;48:3543-53. 8. Wendling M, Zijp LJ, McDermott LN, Smit EJ, Sonke JJ, Mijnheer BJ, et al. A fast algorithm for gamma evaluation in 3D. Med Phys 2007; 34:1647-54. 9. Wendling M, McDermott LN, Mans A, Sonke JJ, van Herk M, Mijnheer BJ. A simple backprojection algorithm for 3D in vivo EPID dosimetry of IMRT treatments. Med Phys 2009;36:3310-21. 10. Depuydt T, Van Esch A, Huyskens D. A quantitative evaluation of IMRT dose distribution: Refinement and clinical assessment of the gamma evaluation. Radiother Oncol 2002;62:309-19. 11. Reich P, Bezak E, Mohammadi M, Fog L. The prediction of transmitted dose distributions using a 3D treatment planning system. Australas Phys Eng Sci Med 2006;29:18-29. 12. Childress N, Bloch C, White R, Salehpour M, Rosen I. Detection of IMRT delivery errors using a quantitative 2D dosimetric verification system. Med Phys 2005;32:153-62. 13. Cozzi L, Fogliata A, Nicolini G. Pre-treatment verification of intensity modulated photon beams with films and electronic portal imaging-two years of clinical experience. Z Med Phys 2004;14:239-50. 14. Olsson LE, Arndt J, Fransson A, Nordell B. Three-dimensional dose mapping from gamma knife treatment using a dosimeter gel and MR-imaging. Radiother Oncol 992;24:82-6. 15. Oliver M, Gladwish A, Staruch R, Craig J, Gaede S, Chen J, et al. Experimental measurements and Monte Carlo simulations for dosimetric evaluations of intrafraction motion for gated and ungated intensity modulated arc therapy deliveries. Phys Med Biol 2008;53:6419-36. 16. Mohammadi M, Bezak E, Reich P. (2006) Comparison of two-dimensional transmitted dose maps: evaluation of existing algorithms. Australas Phys Eng Sci Med, 29:179-87. 17. Mohammadi M, Bezak E. The physical characteristics of a SLIC-EPID for transmitted dosimetry. Iran J Radiat Res 2005;2:175-83. 18. Mohammadi M, Bezak E. Two-dimensional transmitted dose measurements using a scanning liquid ionization chamber EPID. Phys Med Biol 2006;51:2971-85. 19. Mohammadi M, Bezak E, Reich P. The use of extended dose range film for dosimetric calibration of a scanning liquid-filled ionization chamber electronic portal imaging device. J Appl Clin Med Phys 2007;8:69-84. 20. van Dyk J, Barnett RB, Cyglar JE, Shragge PC. Commissioning and quality assurance of treatment planning computers. Int J Radiat Oncol Biol Phys 1993;26:261-73. 21. Mohammadi M, Bezak E. Evaluation of relative transmitted dose for a step and shoot head and neck intensity modulated radiation therapy using a scanning liquid ionization chamber electronic portal imaging device. J Med Phys 2012;37:14-26. 22. Mohammadi M, Bezak E, Reich P. Verification of dose delivery for a prostate sIMRT treatment using a SLIC-EPID. Appl Radiat Isot 2008;66:1930-8.